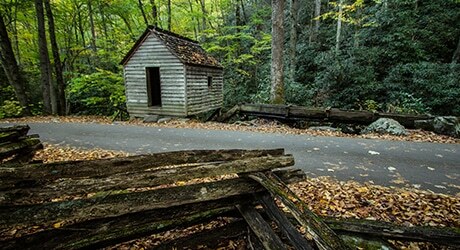 Roaring Fork gets its name from one of the largest and fastest flowing mountain streams within the Great Smoky Mountains National Park. The winding trail allows visitors to slow down and take in the stunning views of the forest, rushing streams and historic buildings including, preserved log cabins, grist mills, and other remarkable structures. If you’re coming from Pigeon Forge, turn off the parkway at traffic light #8 near Gatlinburg, TN. 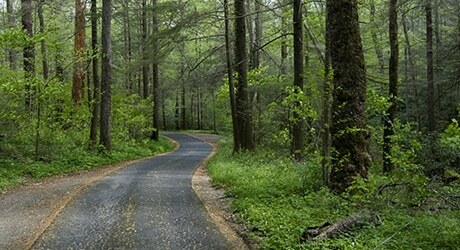 Follow the Historic Nature Trail Road to the Cherokee Orchard entrance to the National Park. The nature trail is closed during the winter. Buses, trailers and motor homes are not allowed on the Roaring Fork Motor Nature Trail.